Donald Siegel, professor in the Department of Earth Sciences in the College of Arts and Sciences, is by any measure a successful scientist. He is the Jessie Page Heroy Professor and a Meredith Professor of Teaching Excellence. He is chair of his department. But that’s not enough for him. He’s always pursuing mastery in other fields. Years ago, Siegel learned how to play chess. He got good enough at it that he could compete in tournaments. Then he moved on to cooking. He got good enough at it that he wrote a kosher Chinese cookbook, published in 2005. Siegel’s latest pursuit is playing the guitar, though to be accurate it’s not just a recent interest. He actually began playing as a child back in the 1960s. When he was a teenager in Saratoga, New York, Siegel asked his dad if he would get him a guitar—basically to get girls, Siegel admits. So Siegel’s father and grandfather went down to the local guitar store and bought him a guitar and found him a teacher. The teacher turned out to be a jazz guitarist who, instead of teaching the youngster songs, taught him “comping,” the strumming of chords to accompany singers. Not exactly what young Don Siegel had in mind to impress the girls. Eventually, Dad got Siegel an electric guitar, a classic Gibson, but it wasn’t long before he felt he had to make a choice between his love of the arts and his love of science. Dad’s advice was that he could always get a job in science and pursue the arts in his spare time, so he went into Earth science. But music fell by the wayside, and he didn’t pick up a guitar for decades. Then, seven years ago, Siegel’s son was getting married. The father of the bride was a musician who taught at a college on Cape Cod. He suggested that he and Siegel play together at the wedding reception. So Siegel dug out his old guitar and started practicing. When all was said and done, Siegel felt he did a respectable job at the event. But Bill Winniker, the leader of the professional band that played at the reception thought he had some potential. So he issued a challenge to Siegel: keep practicing and play with us a year from now at Skipjack’s in Boston. Siegel asked around Syracuse for the best guitar teacher and found Gordon Moore in DeWitt. Siegel started taking weekly lessons from Moore and practicing for hours every day. He says Moore was a really tough teacher. “He actually taught me a bit about how to teach after all these years,” Siegel admits. Siegel made it to his date in Boston, then kept taking lessons with Moore. About five years ago, the teacher said, “I think it’s time for you to get out there. I never thought you’d do it.” Siegel laughs about that a little. 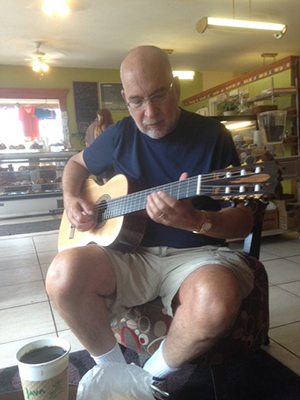 Now, Siegel plays two or three Saturday mornings a month at Picasso’s Pastries and Café on Westcott Street in Syracuse. His pay, he says, is free coffee and bagels. He has been engaged to play occasionally for weddings and other receptions but hopes to do more once he retires in the future.